When I decided to visit Santiago in 2013, I came with few expectations except that I wanted to get a feel for the city and think about moving to Chile (which I eventually did!). My friend Francisca took charge of my initial explorations and brought me to many of the most interesting neighborhoods of Santiago, including Bellavista, where we visited Pablo Neruda’s home, La Chascona, on a rainy day in August. When we headed to Valparaíso, we obviously had to visit the beloved Chilean poet’s other home, La Sebastiana, perched on the hill of Cerro Alegre. 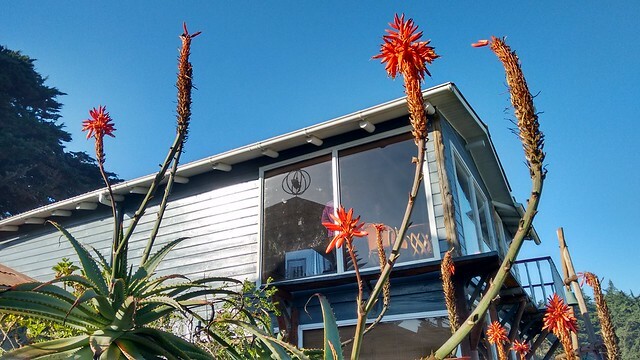 After taking in the quirky style preserved in these houses-turned-museums, I knew I had to visit Isla Negra, Pablo Neruda’s biggest and most beautiful home, located a couple of house south of Valparaíso on the Pacific coast. This was one of the top items on my Chile bucket list, so when Sara came to visit, I took advantage of our coastal adventures to get to Isla Negra. 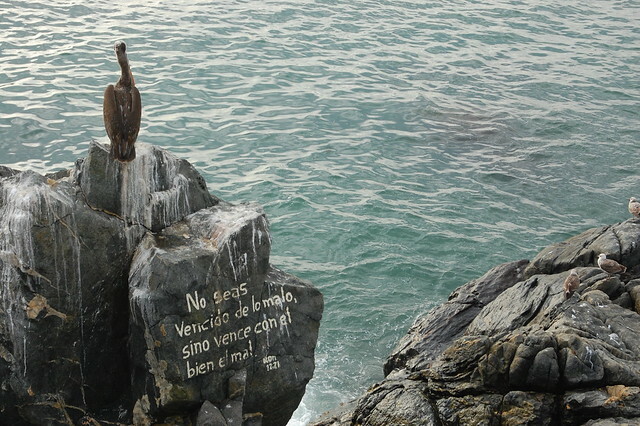 Despite its name, Isla Negra is not actually an island. If you know anything about Neruda, you know that he was fascinated with all things nautical, so he built his home in the shape of a boat, with views looking directly out to the ocean. Standing in his bedroom and taking in the views of the crashing waves from his bed was incredibly moving for me. The Fundacion Pablo Neruda does not permit photography inside any of the poet’s home, so you will have to head there yourself to get a sense of the extensive collections housed within its walls. It is totally worth it just for the views, inspirational in their own right. I wouldn’t mind sitting at Neruda’s desk and spending a few hours a day writing, looking out towards the ocean every times I needed a break. Nor would I mind sitting in the breakfast nook and having a cup of tea, or sharing several bottles of wine with a large assortment of friends over his massive dining room table. For craft fans like me, the museum also celebrates the embroidery of a women’s embroidery collective that Neruda supported. Their creations are intricate and gorgeous, if beyond my budget, and if you’re interested in their techniques, the museum sells starter embroidery kits. Even though Isla Negra is a popular tourist destination, it seems most people arrive by car, and I found it a bit challenging to find information on how to get there. 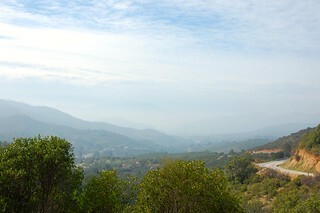 You can get there from either Valparaíso or Santiago, and it is worth the journey for a pleasant day trip. 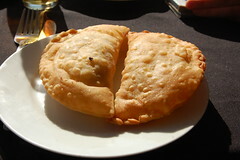 I would suggest going earlier in the day to enjoy some seaside empanadas or spend some time on the beach. Below, I’ve listed my other suggestions as well as tips on how to get to Isla Negra on public transportation. 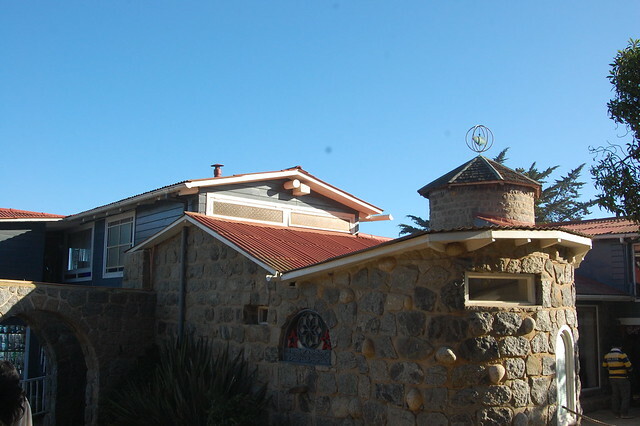 If you weren’t such a fan of the houses in Bellavista or Valpo (like me), Isla Negra is a completely different experience. 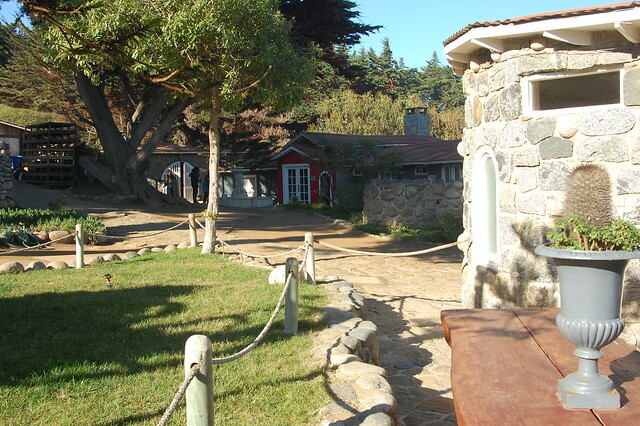 If you can only visit one of Neruda’s houses, make it this one. Buses leaves for Isla Negra from the Valparaíso bus terminal, located by the Congreso. I did not see a posted schedule but they seemed to leave every hour. Make sure you tell the driver you want to get off in Isla Negra. The bus cost $4000CLP on my visit during busy winter vacation. 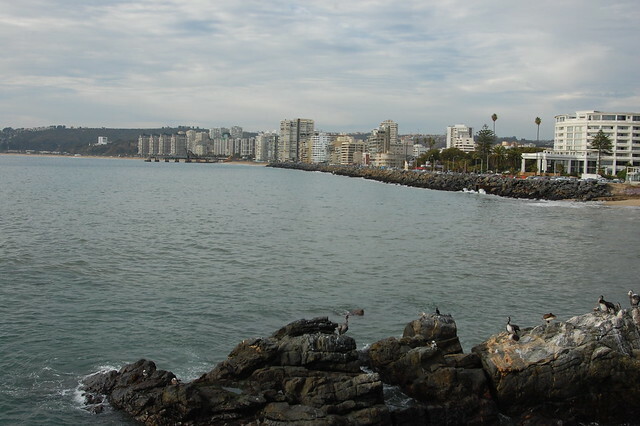 If you are staying in Viña del Mar, as we were, you will have to take a local bus to Valparaíso and then leave from there. 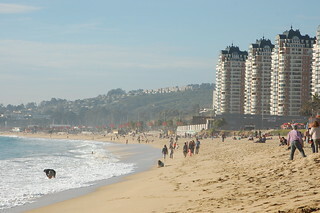 There no buses from Viña to Isla Negra. 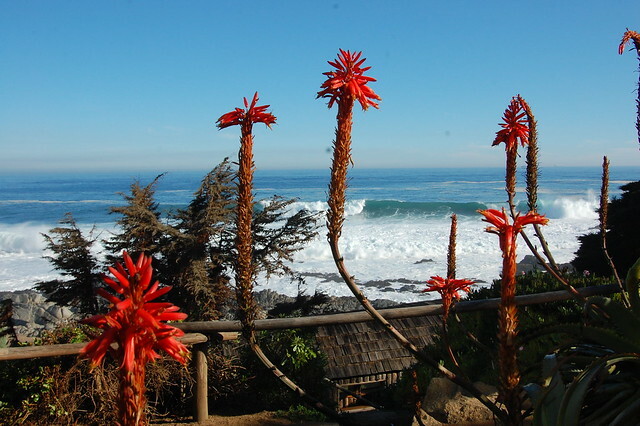 If you would like to head to Isla Negra from Santiago, this is totally possible! 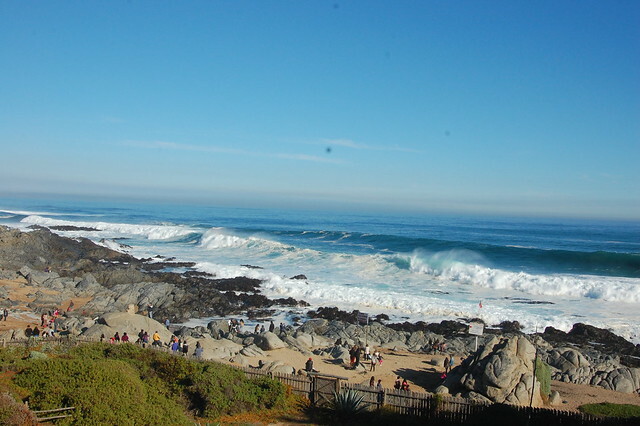 Pullman has a bus route through the Casablanca Valley that passes right through Isla Negra. The buses leave from the Pajaritos and Alameda bus terminals, both located on the Metro Linea 1 (red line). If you’re taking the metro, you might as well just go directly to Pajaritos as it is a brand new, beautiful terminal and the buses will go there after passengers board at Terminal Alameda. (It’s also a little safer, in my opinion.) Buses leave every 15-30 minutes and you’ll need to buy tickets before boarding. We caught a direct bus back to Santiago from Isla Negra, right on the main street. There is a Pullman office in the center of town which offers luggage storage, which is a great option for those travelers like us who were just passing through but still had our luggage. You can see more about the Pullman Bus routes here, but remember that you won’t be able to buy tickets online because these are regional buses rather than long-distance buses. The Isla Negra museum has luggage storage in the form of free lockers, and we were able to get our medium sized backpack and suitcase into them. Try to visit the museum on an off day. The number of visitors allowed into the house at a certain time is restricted and on weekends, holidays, or vacation weeks, this can mean an hour or two wait and a very crowded tour. Even though the tour is with an audioguide, you still move through the house as a group and it can feel a little clausterphobic. Take some time to walk down to the beach and browse the artisan wares being sold along the beach path. Entry to the museum costs $5000. There is an on-site cafe and gift shop, and if you are lucky, there will be a table selling the intricate embroidery from the artisan collective. Even though it is pricey, it is well worth a look to admire the detailed work. 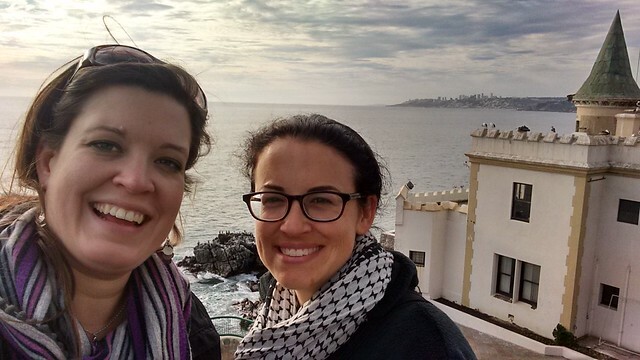 Back in 2013, when I was visiting Chile in order to get a sense of whether I might like to move here, my friend Francisca took me to all the main tourist destinations around Santiago, including a whirlwind tour of nearby Viña del Mar and Valparaíso. 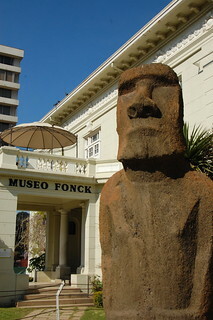 On my first visit, we stopped at the Museo Fonck so I could see the Easter Island exhibit, then followed that up with some empanadas and a walk on the beach before continuing onward to Valpo. 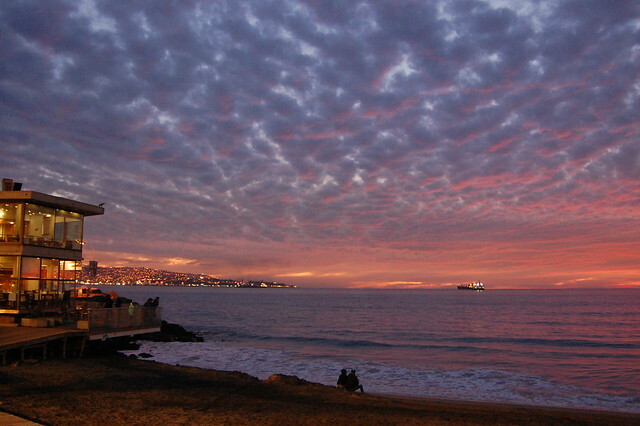 That quick visit left a good impression on me, so I put a return visit to Viña on my Chile bucket list. When my friend Sara decided to make the journey south to Chile during my winter vacation, I saw a good opportunity to return. Since she arrived in the middle of winter (and being from Boston, neither of us are desperate to see more snow! ), we decided to stay on the coast. Sara headed to Valparaíso on a solo adventure and covered so much territory in her explorations that it made more sense to visit Viña del Mar together. 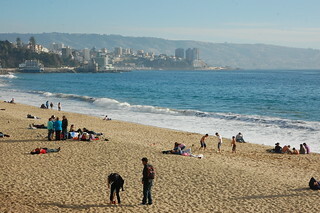 Viña del Mar is an attractive coastal city with plenty of beach to wander at any point of the year. 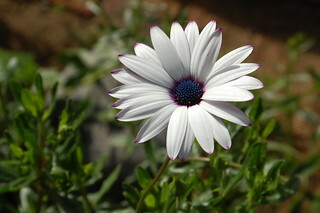 The climate is mild even in winter, and even on cloudy days the sun manages to peek out, as you can see in my photos. 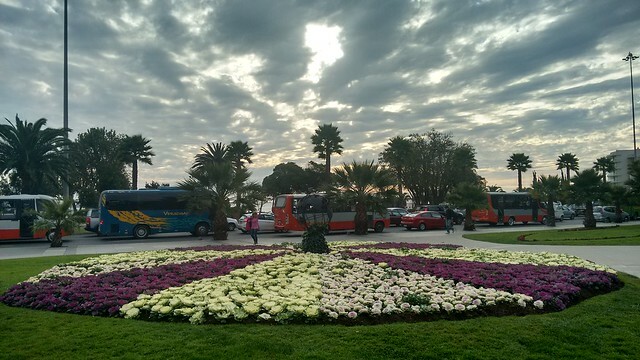 We caught a Viña bound bus from the Pajaritos terminal and enjoyed the comfortable ride to our next destination. After checking in to our AirBnB close to the beach, we headed out to wander along the coastline. Once we reached the beach, I realized that I already knew this stretch of sand, captured in one of my favorite photos of myself. It was a little surreal to recover the same ground as two years before, with a completely different perspective on Chile. Thankfully, Sara is a relaxed traveler and was equally content to wander along the coast and get a sense of Valpo’s sister city. 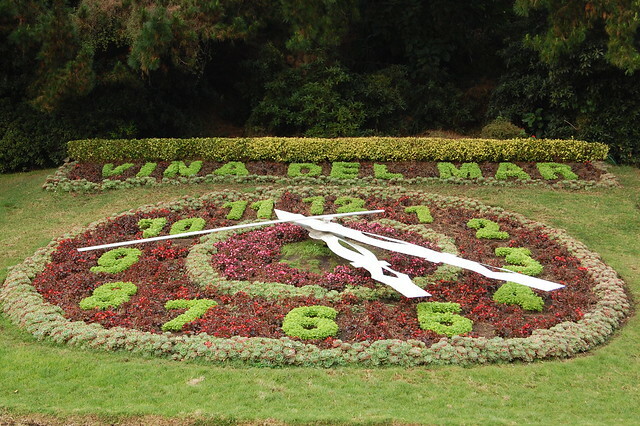 While the botanical gardens were too far away for a short off-season visit, I wanted to make sure we took in the Castillo Wulff (Wulff Castle) and Reloj de Flores (Flower Clock), two distinctive characteristics of Vina del Mar. Castillo Wulff was built by a businessman of German heritage back in 1906, and is still a popular spot with tourists due to its great vantage point and distinctive architecture. 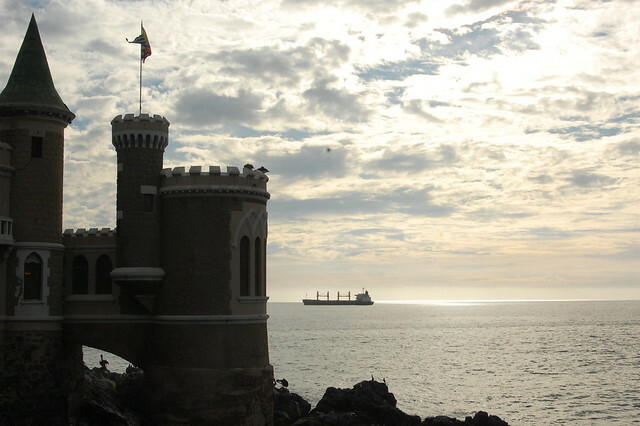 Inside the castle, there is small gallery with temporary exhibits, run by the municipality of Viña del Mar. 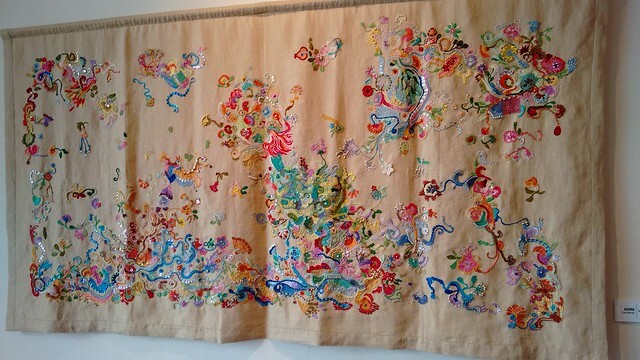 On my visit, the gallery displayed intricate embroidery by local artists, which was perfect for me as a huge fan of textile art. Combined with the amazing folk art exhibit in the Centro Cultural La Moneda in Santiago and the artisan collective at Isla Negra, I am pretty inspired to keep learning more techniques in embroidery. 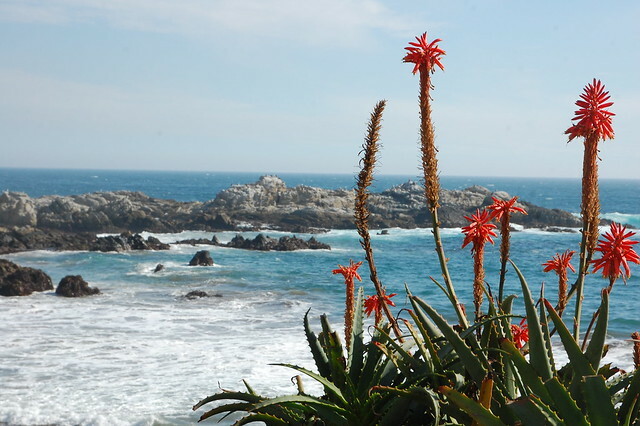 After visiting the castle, we continued along the coast, taking in the views over the ocean right from the sidewalk. 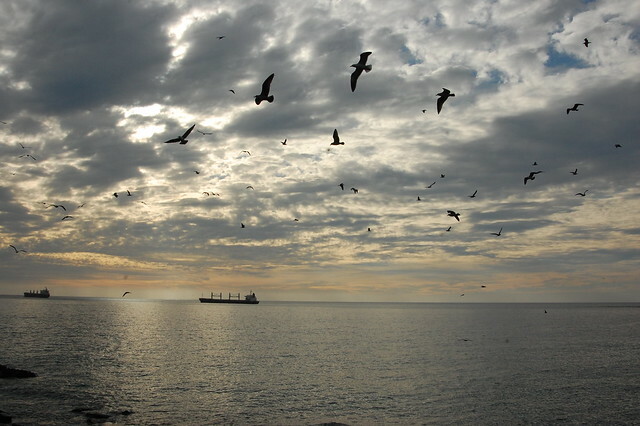 The seabirds circled above, leading me to catch some pretty nice shots of the ocean in the late afternoon sun. After crossing some major streets, we reached the Reloj de Flores, a touristy but attractively landscaped clock located by the one of the entrances to the commerical district. I was particularly intrigued by the plants in the little plaza, which appeared to be kale or cabbage, quite eye-catching in their own right (maybe even cooler than the clock, if you ask me!). Mission accomplished, we headed back along the coast in search of an affordable and hopefully delicious dinner. The late afternoon mix of sun and clouds led to some pretty beautiful skies. We ended up getting pizza at Diego Pizza, a restaurant I was drawn to due to its clean design. 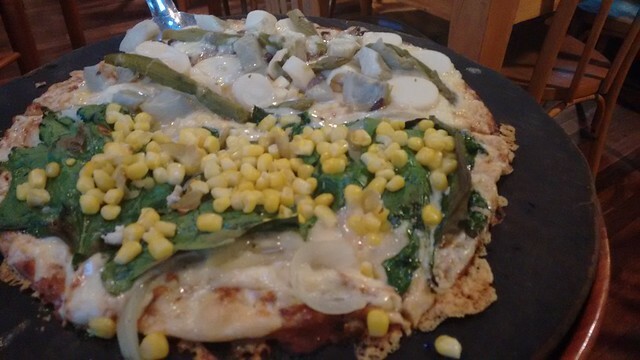 Happily, they had the best pizza I’ve had to date in Chile, made even more flavorful by its roasted garlic and onion. 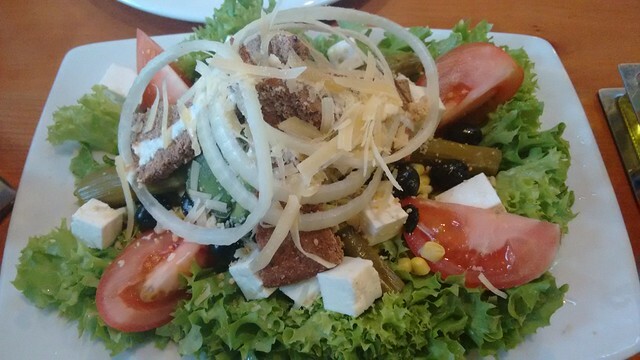 We added in a big fresh salad for balance. 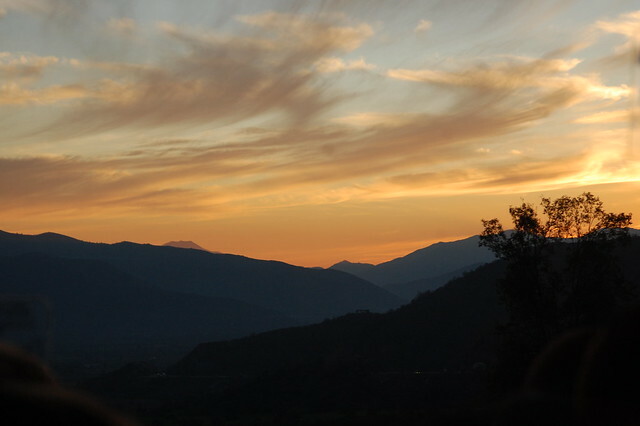 After eating, we hurried outside to catch the tail end of an amazing sunset. That is one of the best things about staying blocks from the beach; the sunsets are all the more accessible. The next morning, we enjoyed a delicious American-style breakfast at our AirBnB before beginning our journey to Isla Negra. While I would probably want more time in Viña during the warm, sunny summer, this was a perfect overnight trip during my winter break and I feel like I got to know the city a little better this time around! 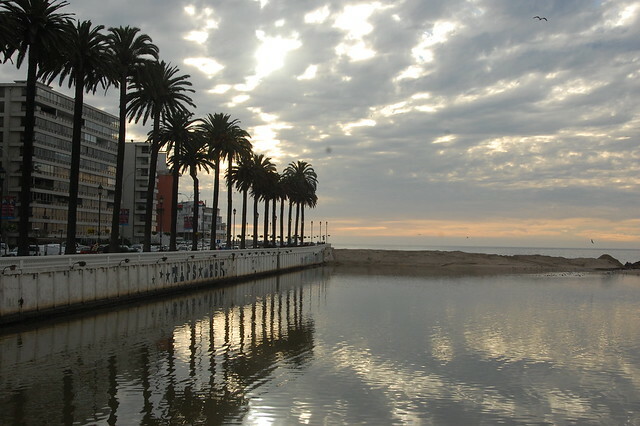 Direct buses to Viña del Mar run from Terminal Alameda and Terminal Pajaritos in Santiago. If you are heading to the bus terminal on the metro, you may as well head directly to Pajaritos as the buses stop in both locations. You buy your tickets from the kiosks inside the newly remodeled terminals. On a holiday during winter vacation, a one way ticket cost $4000CLP. We ended up taking a taxi to our AirBnB, but be aware that taxis are very expensive in Viña and the city is pretty walkable from the bus terminal. Local buses cost $400 per ride, and I found both strangers on the street and bus employees to be quite helpful with helping us get to the bus terminal and to Valparaiso. We stayed at the Speakeasy Guest House, which we booked through AirBnb. 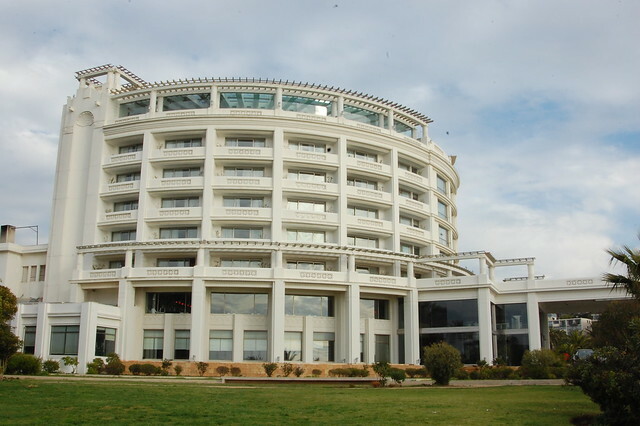 The location is excellent, near the shopping mall, the beach, and a number of restaurants. The owner, a Chilean-American, provides an excellent large American-style breakfast in the morning. He’s a trained chef so it’s worth it just to enjoy the breakfast! I suggest spending some time around the colonial buildings downtown, including Museo Fonck, enjoying empanadas at an open air restaurant, checking out Castillo Wulff, and the Reloj de Flores. 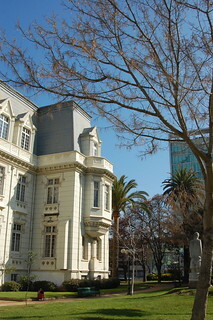 Viña is also known for its botantical gardens. After a whirlwind tour of some of Santiago’s highlights, my friend Francisca whisked me away to her parents’ house in Curacaví for a welcome dinner. Chileans are famous for their hospitality, and true to form, her parents provided “la gringa” with an amazing dinner spread with copious amounts of quality Chilean wine. They were pleasantly surprised to find that I speak Spanish fluently and we laughed throughout the leisurely dinner party. 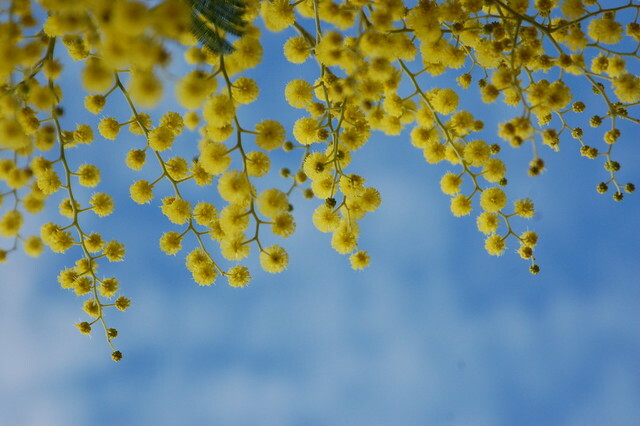 The next morning, I awoke well-rested and was pleasantly surprised to see blue skies and sunshine surrounding us. Curacaví is less than an hour’s drive from Santiago but seems a world away, nestled in the green hills of the lower Andes en route to the coast. Curacaví is a small city which has seen significant real estate development in recent years, particularly gated communities of condominiums. Many years ago, Fran’s parents began constructing their dream house in Curacaví, and her mother’s artistic touches have brought warmth and style to the house. (There are no photos out of respect for their privacy, but trust me, she’s an inspiration!) I was particularly fascinated by the succulents and flowers all over the property, and the lovely views of the surrounding hills. 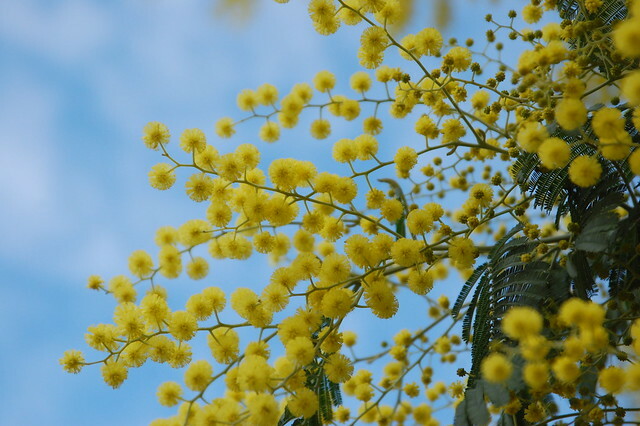 Although it was technically the middle of winter, some of the trees were in bloom, bringing an extra dose of cheerfulness to my morning. 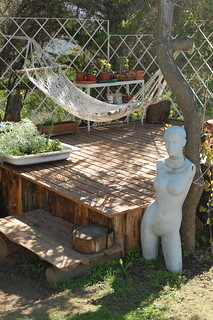 After chilly Santiago, I enjoyed relaxing in the hammock in the warm sunshine. 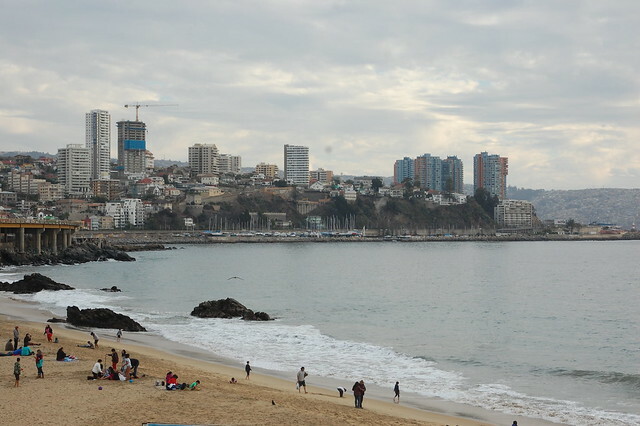 After breakfast, we headed to Viña del Mar. 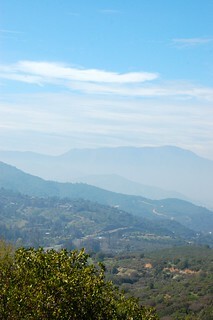 I was excited to finally be back to the Chilean coast, and the views descending from the highway into Viña were lovely. 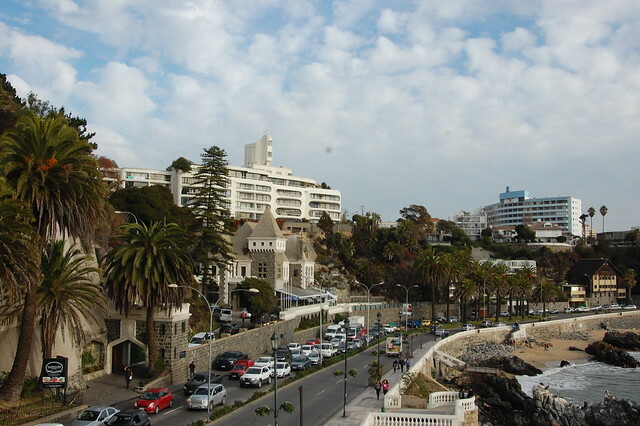 Viña del Mar is famous for its colonial architecture and its annual international music festival, so I was looking forward to experiencing the resort city for myself. Our first stop was Museo Fonck. As you probably know by now, I fell in love with Rapa Nui (Easter Island/Isla de Pascua) when I visited in December 2012, and I had learned that the museum had an impressive exhibit on the island’s history and culture. Most importantly, I wanted to visit the moai sitting in front of the museum, who had been transported so far from his home. I spent a solid hour carefully reading the museum placards and studying the artifacts of Rapa Nui culture. Easter Island’s museum had been closed for renovations when I tried to visit, so I was hungry for more information about the island. As it turned out, the museum closed early on Saturdays, so I wasn’t able to delve into the other exhibits on Chile’s other cultures. However, this was for the best, as it forced us outside into the bright sunshine. We headed to the coastline so that I could take in the ocean. 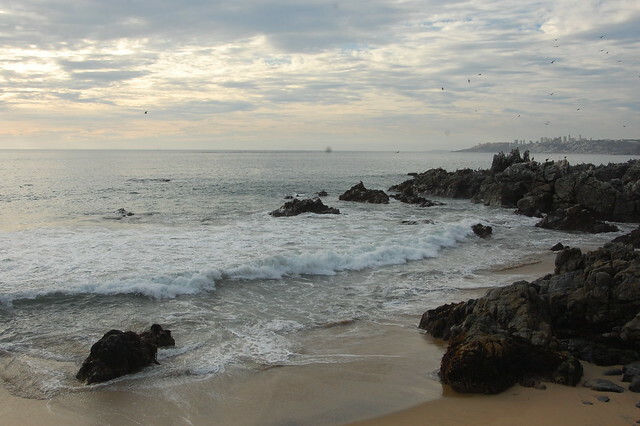 After spending a month in the Andes, I hadn’t realized how much I missed the sound of the ocean! Luckily, one of the typical traditions of Viña del Mar is to eat empanadas at one of the many outdoor cafes that line the coastal road. I was happy to find two vegetarian options and we enjoyed a relaxing lunch as the breeze came in from the water. 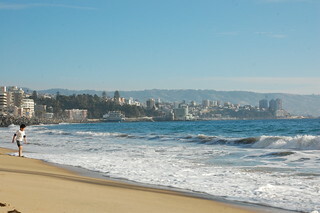 Of course, no visit to Viña del Mar is complete without a stroll on the beach. Although it was the middle of winter, the beach was spotted with other visitors. I couldn’t resist taking off my shoes and feeling the wet sand between my toes. 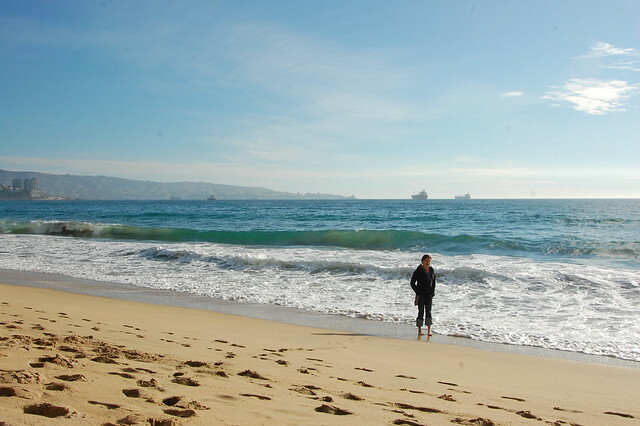 I had to test out the Pacific waters for myself, even if the water was very cold! After wandering along the sandy beach, we headed to the nearby tourist stands set up as a fair, filled with typical souvenirs and sugary treats, like churros and alfajores. This gave me a chance to try some typical Chilean desserts. 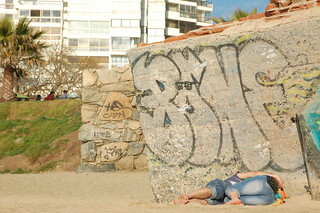 Although we spent only a few hours in Viña del Mar, I enjoyed the coastal vibe. 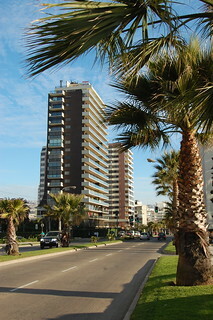 As this photo shows, Viña del Mar is a lot like San Diego, with its palm tree-lined streets and tall hotels. It also reminds me a lot of the pretty malecón in Lima. Next up was Viña’s sister city Valparaíso, which I fell in love with at first sight! Be sure to visit Museo Fonck, but check the posted schedule to make sure you leave enough time for your visit. 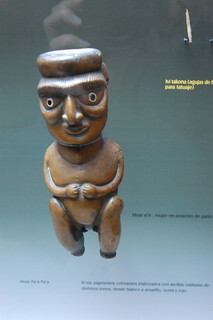 They have an extensive exhibit dedicated to Easter Island, and they also have a Mapuche collection. Admission costs $2.500CLP (about $5). Walk along the coast and have some empanadas and a drink at an outdoor cafe. 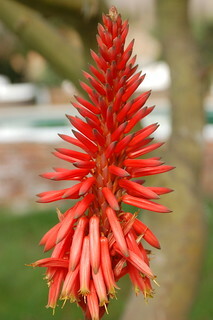 Although we did not have a chance to visit them on our very brief visit, Viña is also known for its botanical gardens. If you can, try to time your visit with the famous International Song Festival held in Viña every February in the Quinta Vergara park, but plan in advance to find a place to stay! 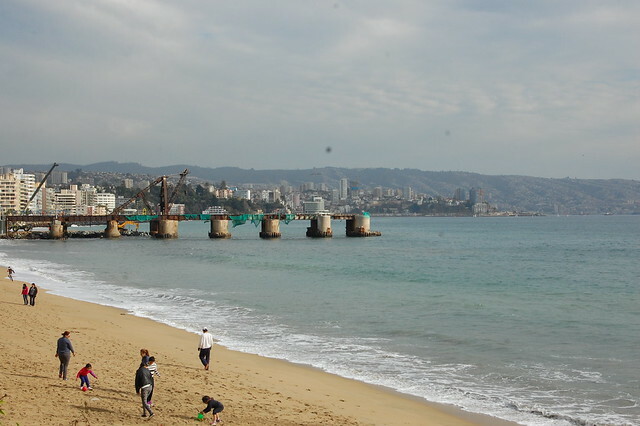 Here are some other suggestions on things to do in Viña del Mar. 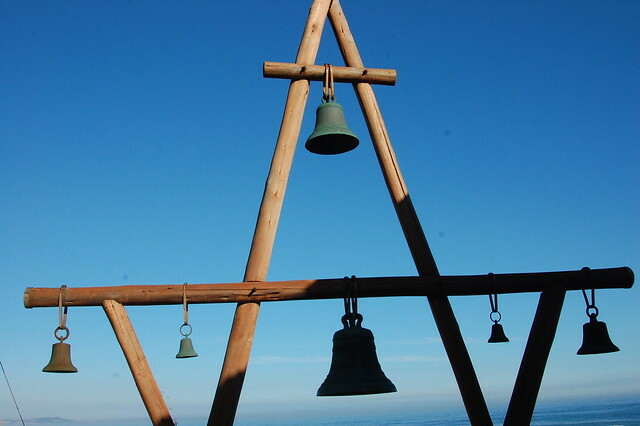 You can also read my more recent post on Viña.